You can move or close this window. To open it again simply click on my image in the bottom-right corner. The hint will give you some help in case you have trouble with progressing in the tutorial. For this task simply click the ‘x’ on the top left of the popup to make it disappear. A red box highlights this. After this you will see how your tasks are summarized on the right hand side. A green tick will show what you have done as well as show what you still need to accomplish. 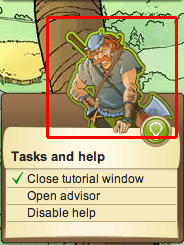 Click on your advisor to the right of the window. He is found above the box summarizing your tasks. A red box will highlight him if you have done this immediately following the previous task. Once again this has a red box showing you want to click. Turning this off will stop the red boxes appearing. From now you will be on your way to running your account all by yourself! If you need to you can reactivate this in the next task. Now you can always get information about your current tasks. The next task will be activated once you have collected your reward. Claim your clay pit now! Your reward: A level 1 clay pit. Open the advisor again and click the ‘Collect reward’ button to receive it and continue on.